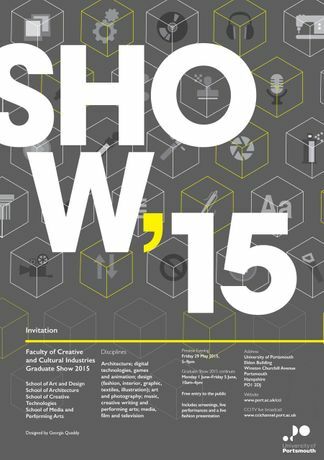 The Faculty of Creative and Cultural Industries are delighted to invite you to join their annual celebration of the talents of our final year students at the Graduate Show 2015. The Faculty of Creative and Cultural Industries are delighted to invite you to join their annual celebration of the talents of our final year students at the Graduate Show 2015, on Friday 29th May, 5-9pm, at the University of Portsmouth, Eldon Building, Winston Churchill Avenue, Portsmouth, PO1 2DJ. The Faculty's exceptional success is shared with local, national and international communities at this important event in the academic and cultural calendar in Portsmouth. The Eldon campus will be transformed into a gallery, cinema and media complex to showcase graduating students’ work in a broad range of creative disciplines, accompanied by a gala of Eldon Courtyard events including musical and physical theatre, a live fashion presentation, an architectural installation and alumni performances by Peach and the New Beats and Batala Portsmouth drummers. The Graduate Show and pre-show interviews will be broadcast live from CCI TV from midday - 8pm. The show continues Monday 1st June-Friday 5th June, 10am - 4pm. Please note that we are unable to provide a 'bag drop' facility on site.